From January to March 2019, experience rallying on ice and snow in our thoroughbred Group N Mitsubishi Lancer Evolutions and Subaru Impreza WRX STis. Each winter the studded tyres go on and we head to Salen, Sweden for the most extreme rally experience on the most exhilarating driving surface, ice! Our winter rally package provides the very best tuition on the most exciting of rallying surfaces. 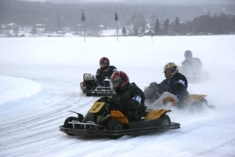 Also included is a superb ice karting Grand Prix and the option fly through the Swedish forests on a snowmobile trek. Whether a novice enthusiast, corporate guest or professional driver, you have the options to meet your needs. Each winter the studded tyres go on and we head to the picturesque frozen lakes of North Löten, Sweden for the most extreme rally experience, driving Mitsubishi Evos and Subaru Imprezas on the most exhilarating driving surface, ice! Our winter rally package provides the very best tuition on the most exciting of rallying surfaces! The important part, here at extreme rally we don't waste our time or yours in cars that are not up to scratch. Our Group N Mitsubishi Lancer Evolutions and Subaru Impreza WRX STis are rally thoroughbreds capable of reaching 0-60 mph in under 4.5 seconds, being four wheel drive means they can take on the most extreme of stages and surfaces, and makes the ice experience even more exhilarating! Over the past few years both the Mitsubishi Lancer Evolution and the Subaru Impreza WRX STi have been at the top of the rally world championships. The winter rally experience provides the chance to test out these supercars on our ice stages to see if you have the skill to get the very best out of these incredible cars. Keeping this experience as close and as authentic to world championship rally cars, the cars are fitted with specialised studded tyres, allowing tremendous grip whilst flying around corners and keeping you on the ice during extreme braking, getting your adrenaline flowing and makes this an experience to remember! The lakes house fully prepared rally stages that include full hairpin bends, rapid straights and long flowing corners perfectly complementing the muscle and agility of the Evos and the Impreza whilst allowing you to put into practice your newly acquired power sliding skills! Your package will include Ice Karting on a lake near the hotel, this activity is one of the hottest apres-ski activities in Sweden and is not to be confused with any mundane indoor karting experiences you may have had in the UK! These karts are equipped with fully studded tyres which ensure that you grip to the ice, but enable you to keep your speed into the corners challenging you to see just how big your power slides can be! This is the perfect introduction to the art of rallying on ice! The Hotel Hogfjallshotell Salen hosts 105 en-suite bedrooms all with cable TV, breakfast is included in your package for the duration of your stay, the restaurants offer a great variety of food all delivered at a very high standard. For those of you with any energy left the hotel offers fantastic entertainment including an onsite nightclub. The hotel has its own extensive shop offering clothing in its sports-shop; ski rental; a grocery store and general shopping. Two nights accommodation in the Hogfjallshotell Hotel, Salen. Ice Karting on a nearby lake. We also offer the chance to participate in other activities including driving snow mobiles through the forests, extras such as these can be pre-booked within your package, or booked on arrival at the resort. We can also accommodate non-drivers for more information please contact us. Packages can be booked Monday to Wednesday or alternatively Friday to Sunday. Flights are not included in the package, transfers are from Oslo Gardermoen, British Airways or SAS. Please note, price is based on group travel. Unfortunately, we are unable to cater for individuals for this event.